This is a beaded Fairisle blanket or throw, knitted entirely in the round. 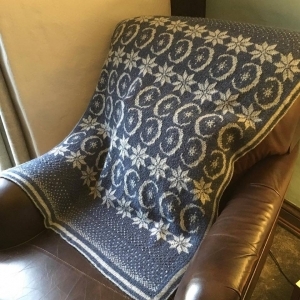 It is designed with a steek bridge so you steek your blanket and then add the mitred border. The pattern includes full instructions on beading. I do not include steeking instructions as there are several ways to do this. I use surface crochet. I rate this as moderate to challenging.